There are a wide variety of Miami Beach Oceanfront hotels that boast special features that will enhance your stay while visiting this gorgeous white sand paradise. Ideal choices are the Fontainebleau Miami Beach with ten swimming pools and the Carillon Miami Wellness Resort features kitchens in every unit. Mid-Beach hotels include the Confidante Miami Beach by Hyatt and the Miami Beach EDITION which has a lively younger adult crowd. On the southern end of Miami Beach you will find the COMO Metropolitan Miami Beach which is perfect for people looking to be closer to South Beach. 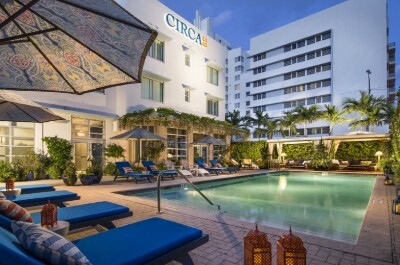 Mid-range selections include Circa 39 Hotel at Mid-Beach which is great for younger couples as well as the Hotel Croydon Miami Beach. 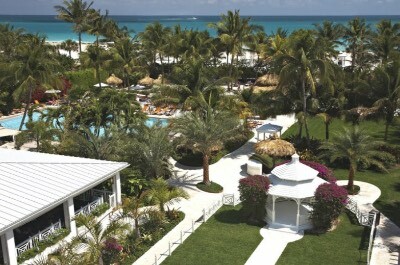 Couples looking for romance should try the Palms Hotel and Spa or the Grand Beach Hotel. No matter what you are searching for in a hotel you can it along Collins Avenue and Miami Beach. When you are searching for a luxurious boutique Miami Beach hotel that is perfect for couples and romance as well as being close to South Beach, then the COMO Metropolitan Miami Beach is a must stay place. Located along Collins Avenue on the northern edge of South Beach, the COMO Metropolitan Miami Beach is situated where South Beach meets Miami Beach and boasts direct access to the white sandy beach area overlooking the Atlantic Ocean. The COMO Metropolitan Miami Beach hotel has a fantastic Art Deco architectural style with 74 rooms and suites which feature an Art Deco interior. City rooms range in size from 330 to 392 square feet with a view of the city and Metropolitan rooms are sized similar with a partial-ocean or Lake Pancoast view as well as a balcony option. Metropolitan Ocean view rooms have 394 to 436 square feet with stunning views of the Atlantic Ocean. The one-bedroom Lake view suites have 584 square feet with a corner location, a separate living room and outstanding views of Lake Pancoast, the city and the Intercoastal Waterway. Ocean views suites are sized at 790 square feet with one-bedroom, a separate living room, 1.5-bathrooms and huge views of the ocean. The COMO suite has one-bedroom, a separate dining room and living room with big views of the Atlantic Ocean. The beach area at COMO Metropolitan Miami Beach is beautiful with white sands and plenty of space to relax. Swimming is great and you can arrange other watersport activities like kitesurfing, sailing as well as parasailing with the concierges. You have an easy walking distance to the Miami Beach Boardwalk, the Bass Museum of Art and the Miami Beach Botanical Garden. The COMO Metropolitan Miami Beach hotel has a nice freshwater swimming pool which features a tree-lined sundeck as well as food and drink service. There is a rooftop hydro-therapy pool, a fitness center, shopping boutique and full service spa. Dining onsite includes the highly acclaimed Traymore which serves all three meals and you can find poolside dining at the Met Pool Restaurant and Bar. You can venture offsite for dining with several restaurants within walking distance such as the Dutch for American style dishes, Cantina 27 serves Italian and Sylvano prepares European specialties. Nightlife includes a drink at the Traymore Gin Bar or venture offsite to the Wall Lounge, the Aerobar and the Treehouse are all within walking distance. If you are looking for a luxury Miami Beach hotel that offers plenty of amenities for couples and families, then the best place to stay is the Carillon Miami Wellness Resort. Located along the northern end of Collins Avenue, the Carillon Miami Wellness Resort is situated on a nice stretch of white sand on North Beach with great views of the Atlantic Ocean. The Carillon Miami Wellness Resort has an interesting modern high rise architectural style with 150 suite type rooms that feature a contemporary chic decor. One and two-bedroom suites range in size from 720 to 1,200 square feet and feature floor to ceiling windows, a separate living room, a full kitchen and views of the city skyline or Atlantic Ocean. The Carillon Miami Wellness Miami Beach hotel occupies 750-feet of private beachfront along the white sands of North Beach. There is plenty of space to lounge and the water is great for swimming as well as other watersport activities which you can arrange with the hotel. You are within walking distance to the North Shore Open Space Park, the Miami Beach Boardwalk and families will like Bonkerz Miami Beach for games. The Carillon Miami Wellness Resort has several complimentary fitness classes for adults throughout the day as well as children activities but there is no kid's club. 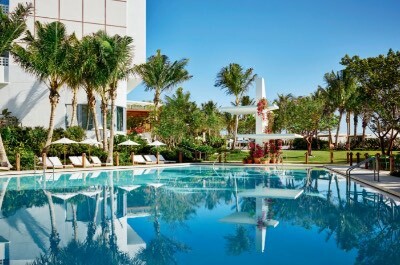 The Carillon Miami Wellness Miami Beach hotel has two freshwater swimming pools with one open to all ages and the second is a 16 or older pool which tends to be quiet. The resort features a two-story climbing wall, fitness center, shopping boutique and a full service spa onsite. Dining onsite includes Thyme which prepares innovative fusion cuisine and Carillon Lounge serves up pub fare. There is a grocery store located across the street for you to enjoy a home cooked meal in your full kitchen. Offsite dining selections within walking distance include BurgerFi for quick bites, Cafe Prima Pasta prepares Italian and Little Brazil serves South American cuisine. Nightlife includes a drink at the Carillon Lounge or you can walk to the Sandbar Lounge as well as the Byron Carlyle Theater is perfect for art cinema and a 20-minute taxi ride will take to the action within South Beach. When you are searching for lively atmosphere at a luxury Miami Beach hotel that is ideal for a younger adult and couples, then you should stay at the Miami Beach EDITION. Located along Collins Avenue at Mid-Beach, the Miami Beach EDITION is situated on 3.5-acres along a great stretch of white sand overlooking the Atlantic Ocean and was completely renovated in 2014. The Miami Beach hotel EDITION has a modern low rise architectural design with 294 rooms and suites which have a trendy chic decor. All room types feature floor to ceiling windows for big views. Standard and City view rooms range in size from 385 to 560 square feet; Ocean view rooms are sized between 380 and 425 square feet; Deluxe City view rooms have 640 square feet and Oceanfront Balcony rooms feature 429 to 471 square feet of living space. Suites feature living rooms, separate bedrooms and floor to ceiling windows. Oceanfront suites are sized at 788 square feet; The Deluxe Oceanfront suites have 1,135 square feet of space and the Penthouse features 2,825 square feet with 1.5-bathrooms. There are seven bungalow styles available which feature a separate bedroom, living room and dining area as well as a private balcony. 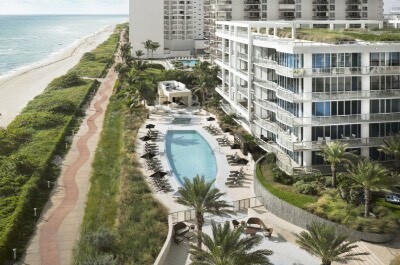 Pool view ranges from 395 to 433 square feet and Oceanfront views are 780 square feet. Oceanfront suites have 697 square feet with a larger outdoor terrace. The Loft Ocean view features 1,587 to 1,615 square feet on two-levels of living space, a sauna and partial-ocean view. Pool view suites are corner units with 1,627 square feet of space with pool and resort views from a wrap-around balcony. Premier Ocean view suites are sized at 780 to 800 square feet on two-levels of living space and include a private plunge pool as well as partial-ocean views. Penthouse Bungalows combine 688 square feet of indoor space with an additional 1,900 square feet of outdoor living area on two-levels with a wrap-around balcony, an elevator and private plunge with superb ocean views. The Miami Beach hotel EDITION has 70,000 square feet of private beach front along the white sands of Mid-Beach where you can lounge and swim as well as arrange for other watersport activities. The Beach Club features upgraded amenities and access to all of the resort's attractions. The Miami Beach EDITION has a splendid freshwater swimming pool with poolside service as well as cabanas for rent and the Sandbox area is perfect for relaxing on a hammock. The Miami Beach EDITION has several unique amenities onsite such as an ice rink, bowling alley, fitness center, underground nightclub and full service spa. Dining onsite has the Market at EDITION features all three meals; Tropicale serves poolside lunches and the renowned Matador prepares innovative cuisine for lunch as well as dinner. Nightlife includes the Matador Bar features a nightclub atmosphere and the Lobby Bar prepares chic hand-tossed cocktails. When you want to find an affordable luxury Miami Beach hotel that is ideal for couples and convention goers, then the Nobu Eden Roc Miami Beach Resort is a perfect selection for you. Located along Collins Avenue just north of Mid-Beach, the Nobu Eden Miami Beach Resort is situated directly on the white sands of Miami Beach overlooking the Atlantic Ocean. The Nobu Eden Roc Miami Beach hotel is actually two hotels within the same grounds which feature a modern high rise architectural style with 631 rooms and suites that feature an eclectic contemporary decor. Deluxe rooms at the Nobu range in size from 380 to 400 square feet with a choice of bedding and views of the city. 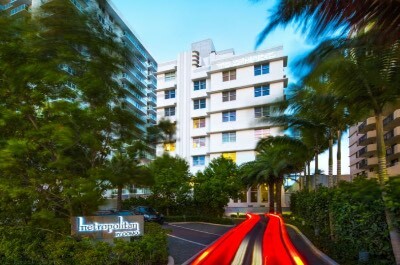 The Intercoastal rooms have 380 to 400 square feet with two queen beds and views of Biscayne Bay. The Ocean view with balcony are sized similar and feature a view of the Atlantic Ocean from a private balcony. The Eden Roc portion of the hotel has Ocean view rooms that feature 650 square feet of living space with a choice of bedding and ocean views. The one-bedroom Oceanfront suite is nicely sized with a separate living room, floor to ceiling windows and private balcony with big ocean views. The Bi-Level Loft has 700 square feet of living space on two-levels with a separate living room, floor to ceiling windows and a private balcony with views of the resort, city or ocean. 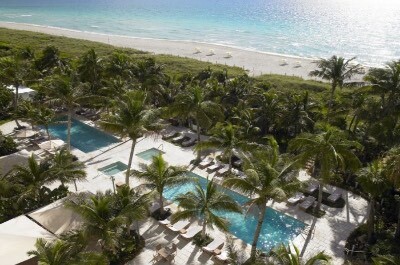 The white sand beach at Nobu Eden Roc Miami Beach Resort is fabulous with plenty of space to lounge and swimming is good. You can arrange for other watersport activities with the onsite concierges. You are within an easy drive to several attractions which include art at Art Basel, boat rentals as well as Jackie Gleason Theater of the Performing Arts and you can walk the Miami Beach Boardwalk. The Nobu Eden Roc Miami Beach hotel has three stellar Infinity freshwater swimming pools which include a rooftop adults-only pool. The resort has a fitness center, shopping boutique and a full service spa. Dining includes the world-renowned Nobu Restaurant serves all three meals and there is light fare available at the Lobby Bar. Restaurants offsite within walking distance include Scarpetta for Italian, Hakkasan for Mediterranean and the Forge for steaks. Nightlife within walking features the Well Lounge, LIV and Bleau Bar which all have dance club atmospheres. If you are searching for a great Miami Beach hotel that has a lively atmosphere and is suited for couples, families and groups, then the Confidante by Hyatt is an ideal choice. Located along Collins Avenue at Mid-Beach, the Confidante Miami Beach by Hyatt is situated directly on the white sands of Miami Beach and has a great view of the Atlantic Ocean. The Confidante Miami Beach hotel by Hyatt has a splendid Art Deco architectural style with 380 rooms and suites which feature an Art Deco retro decor. Standard rooms range in size from 250 to 300 square feet of living space with a variety of views. Ocean and partial-ocean view rooms are 325 to 400 square feet with some rooms having a balcony. Deluxe rooms are sized from 235 to 600 square feet with some rooms having an integrated sitting area as well as balconies with city skyline views. Suites range from 625 to 1,025 square feet with separate living rooms, bedrooms and balconies that feature a city or ocean view. Mid-Beach has superb white sands that offer plenty of space to relax and lounge under the sun. You can swim and arrange for a variety of other watersport activities onsite. You can walk the Miami Beach Boardwalk in either direction, visit the Art Deco District and you are only a 10-minute drive from South Beach. The Confidante Miami Beach hotel by Hyatt has two freshwater swimming pools which boast poolside service and there is an excellent rooftop spa as well as a fitness center onsite. Restaurants onsite range from Bird and Bones for innovative American cuisine for all three meals to Asian fare at TALDE Miami Beach to gourmet dishes at Nina's House and the Backyard serves light fare poolside. Dining options within walking distance include Chez Bon Bon for quick bites, Los Fuegos by Francis Mallmann serves Latin and Cleo prepares Middle Eastern dishes. Nightlife includes live music on selected at the lobby bar or offsite at the Broken Shaker Bar and Arkadia are within walking distance. When you are looking for a value oriented mid-range Miami Beach hotel that is ideal for couples and families, then you should stay at Circa 39 Hotel. Located along Collins Avenue at Mid-Beach, the Circa 39 Hotel is situated within a lush tropical atmosphere across the street from Mid-Beach and features direct access to the white sand beach. The Circa 39 Hotel has a modern architectural design with 97 rooms and suites which feature a trendy retro island decor that were renovated in 2014. Guest rooms range in size from 200 to 250 square feet with a choice of bedding. Friends and families can connect two rooms for a total living area of 450 square feet with a variety of bedding choices. The one-bedroom Meet and Retreat is sized at 600 square feet with a separate living room. All guest rooms boast a view of the gardens or city. The Circa 39 Miami Beach hotel has a nice stretch of private white sand along Mid-Beach which features loungers for sunning, great swimming conditions and a variety of watersport activities which can be arranged with the hotel or on the beach. You are a short taxi ride away from South Beach, the Holocaust Memorial, boat rentals and the Miami Beach Botanical Garden. There is a nice freshwater swimming pool with a sundeck that is surrounded by lush garden and poolside service is available. The Circa 39 Miami Beach hotel has a fitness center and you are within walking distance to several full service spas including the Palms Spa Aveda. Dining onsite includes Jules Kitchen where you will find a breakfast buffet and an ala carte menu for lunch as well as dinner of tapas-style cuisine. Offsite dining selections within walking distance include Cecconi's for Italian, the Matador Room serves Spanish dishes and the Latin Cafe prepares Cuban specialties. Nightlife is great at the onsite Wunderbar and you are within an easy walk to the Blacksmith for club-style dancing. When you are searching for a luxury Miami Beach hotel which features an oasis style atmosphere for couples, then the ideal choice for you is the Palms Hotel and Spa. Located on Collins Avenue within a lush tropical landscape, the Palms Hotel and Spa is situated along a stretch of private white sand beach overlooking the Atlantic Ocean. The Palms Miami Beach hotel has a modern high rise architectural design with 251 rooms and suites that feature a contemporary beach decor. City view rooms are sized at 270 square feet and offer various views of downtown Miami. Garden view rooms range in size from 380 square feet for Preferred with a choice of bedding to 470 square feet for the Superior category which also feature a partial-ocean view. Oceanfront rooms have 380 square feet with floor to ceiling windows and the Superior oceanfront has 470 square feet of living space. You can combine two rooms for an Oceanfront Family unit which increases your living space to 760 square feet. Junior suites offer 490 square feet of integrated living area with floor to ceiling windows and a balcony with a city view. One-bedroom suites feature 790 square feet with a separate living room and a private balcony with views of the Atlantic Ocean, pool, city and gardens. The Palms Hotel and Spa has a perfect spot on the white sands of Miami Beach which are superb for lounging, swimming as well as a variety of watersport activities which you can arrange with the concierges. The Tiki Bar provides for beach and poolside service for your convenience. You can enjoy direct access to the Miami Beach Boardwalk and you are within to the see the art at the Blank Canvass Gallery as well as boat rentals at the Miami Marina. The Palms Miami Beach hotel has a freshwater swimming pool with a nice sundeck, a fitness center, shopping boutique and a full service spa. Dining onsite includes Essensia Restaurant for all three meals as well as also a great Sunday brunch and the Tiki Bar features light fare during the day. Offsite dining selections include Beachcraft for seafood, STK grills steaks and Vintro Kitchen has Mediterranean cuisine. Nightlife at the Cabaret South Beach, Wall Lounge and Treehouse Miami are only a short taxi ride away. When you want to stay at a family-friendly luxury Miami Beach hotel, then the Fontainebleau Miami Beach is perfect for your family as well as couples and people attending conventions. Located along Collins Avenue within a quiet residential area, the Fontainebleau Miami Beach is situated on a nice stretch of white sands and 15-minutes away from South Beach. The Fontainebleau Miami Beach hotel has four towers with an interesting Art Deco high rise architectural design that contains 1,504 rooms and suites which feature a modern decor. Deluxe rooms have 300 square feet of living space with a variety of bedding choices as well as views of the city or Biscayne Bay and Ocean view rooms have 320 square feet with a view of the Atlantic Ocean. Deluxe Bay and Oceanfront rooms range from 320 to 400 square feet with a balcony and views of the bay or ocean. Junior suites range from 500 to 640 square feet with an integrated living area and some feature small kitchenettes as well as balconies or floor to ceiling windows. The one-bedroom suites range in size from 750 to 1,115 square with over many featuring a balcony, full kitchen, multiple bathrooms, separate living room and range in size from 900 to 1,011 square feet with views of the ocean. Two-bedroom suites are available by adding an adjoin guest room or junior suite. Specialty suites range in size from 950 to 9,850 square feet and feature one to five bedrooms with multiple balconies, separate living rooms, multiple bathrooms and stunning views of the ocean as well as the city. 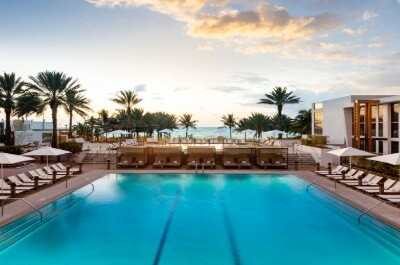 The Fontainebleau Miami Beach hotel has an ideal spot on the white sands of Miami Beach where you can enjoy lounging, swimming and a variety of watersport activities which you can arrange with the concierges. The Fontainebleau Miami Beach has several scheduled events throughout the day for adults and the kid's club is ideal with organized activities for children which is a crowd pleaser with families. There are eleven stunning freshwater swimming pools which include a family pool with waterslides, the Arkadia Club features a 21 and over atmosphere with DJ's and there are several pools geared for romance as well as just relaxing. The Fontainebleau Miami Beach contains a fitness center, kid's club, shopping boutique, activities desk, marina and a full service spa. Dining brings lots of onsite choices with quick bites at Chez Bon Bon; Casual dining at Vida, Blade La Cote as well as the Pizza and Burger. Fine dining can be found at Hakkasan, Scarpetta and Stripsteak by Michael Mina. Nightlife onsite features LIV and Bleaulive where you will find club style atmosphere as well as several onsite bars which feature signature libations. If you are searching for an upscale mid-range boutique Miami Beach hotel that is trendy and is ideal for couples as well as young adults, then try the Hotel Croydon Miami Beach. Located along Collins Avenue, the Hotel Croydon Miami Beach is situated at Mid-Beach and is one block away from a white sandy beach as well as the Miami Beach Boardwalk. The Croydon Miami Beach hotel has a modern seven-story architectural style with 104 rooms that sport a contemporary chic decor. Rooms feature either one or two queen size beds with ample living space. No balconies and views vary from the pool to city to Atlantic Ocean. The Hotel Croydon Miami Beach is one block away from Mid-Beach which has excellent white sands and plenty space to relax. You can also enjoy a variety of watersport activities and you can arrange these with the concierges. You are within walking distance to a few attractions such as the Black Canvas Gallery for art, the Miami Beach Boardwalk and the Holocaust Memorial is within a 5-minute drive as well as 20-minutes to South Beach. The Croydon Miami Beach hotel has a freshwater swimming pool and an excellent rooftop terrace that is ideal for sunning. The property has a fitness center, yoga studio, shopping boutique and a full service spa. Dining onsite features the trendy Tavern with a sidewalk patio and serves all three meals daily. Offsite dining options within walking distance could include Pao by Paul Qui for Asian, the Forge prepares steaks as well as the Matador Room which serves South American cuisine. Nightlife at Hotel Croydon Miami Beach includes a fabulous happy hour at the Tavern and a relaxing sunset from the rooftop terrace. There are several offsite opportunities at the Living Room and the Broken Shaker Bar which are within walking distance. If you are looking for a great family-friendly Miami Beach hotel that is directly on the beach, then you should Book Now at the Grand Beach Hotel. Located along Collins Avenue, the Grand Beach Hotel is situated within the northern portion of Miami Beach adjacent to a quiet residential neighborhood. The Grand Beach Miami Beach hotel has a modern architectural design with 430 suites which were renovated in 2015 and boast a contemporary decor. There are nine different suites available and each suite has a furnished private balcony. Classic and King Pool view suites have 440 square feet of living area with two bathrooms, an integrated living and views of the pool, partial-ocean, bay or bay front. Bay, Ocean, Bayfront and Oceanfront suites have a similar floorplan and offer respective views. These units are also available with double beds which feature 500 square feet of living area and one bathroom. One-bedroom Ocean view suites have 670 square feet of space with a separate living room, two bathrooms and two balconies. Two-bedroom corner suites are 840 square feet with a separate living room, two bathrooms and available with a bayfront or oceanfront view. Family suites are two adjoining suites with two-bedrooms, two living rooms, two bathrooms and two balconies with views of the bay or ocean. Penthouse Bay view suites have 880 square feet with one-bedroom that has two king beds and one bathroom with an additional bed as well as bathroom within the integrated living area and two balconies. The Grand Beach Hotel has a perfect spot on the northern end of the white sands of Miami Beach and features the Beachside Pool Cocktail Bar for libations. You have direct access to lounging, swimming and a variety of watersport activities. The Grand Beach Hotel has several nice attractions within three miles of the properties which include the Miami Beach Botanical Garden, boat rentals, Britto Central for art and the Miami Beach Boardwalk. 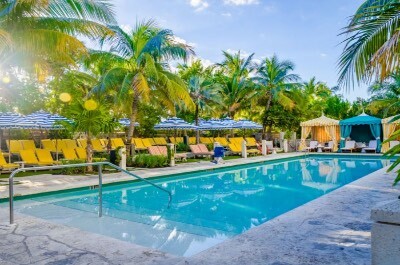 The Grand Beach Miami Beach hotel has three freshwater swimming pools including a rooftop tranquility pool with bar service as well as an adults-only pool. The property has a fitness center, library, business center and a limited service spa. Dining on the property includes Chez Gaston for casual family dining for all three meals. Offsite dining choices may include Stripsteak by Michael Mina Hakkasan for Chinese and La Cote prepares Mediterranean cuisine. Nightlife onsite includes a sunset drink at the rooftop bar and within walking distance offsite there is the Bleau Bar and LIV.